For a bridle with an optimal fit, it is advised to call upon an expert. Bridle2fit works with resellers who make house calls to fit a bridle. They have the knowledge and skills to determine which bridle parts are best suited to the anatomy of the head of your horse or pony. View here which companies are resellers of Bridle2fit! How do I determine the sizes of my bridle? The easiest way is to measure the parts of your current bridle. These measurements can be compared with the Bridle2fit size charts below. With the bitring-bitring size, see the image, can be determined with the size chart below, which size crown piece and cheek pieces are almost always best suitable. 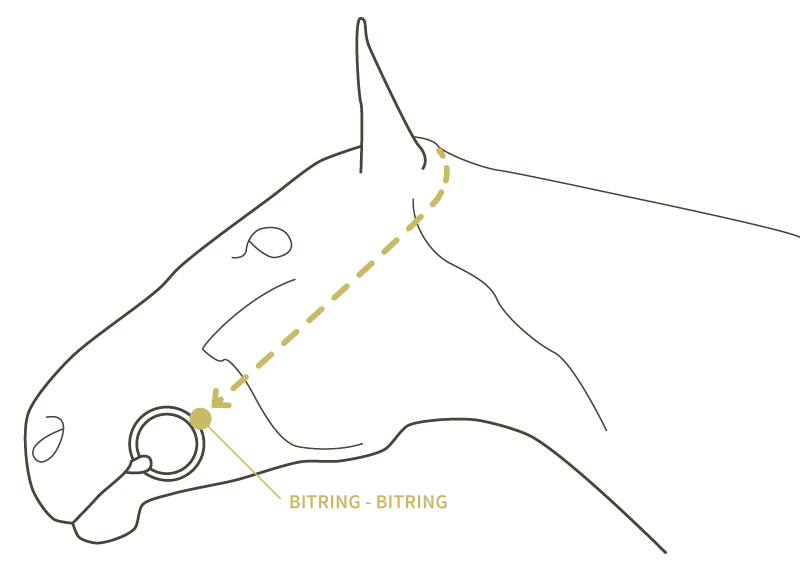 The bitring-bitring size is measured from the bitring, all the way over the head of the horse, to the other bitring.